The Riviera Golf & Country Club which prides itself for having won Best Golf Course in Asia for 2006 and Philippines Best Golf Course for 2008 for its 18 hole Bernhardt Langer Course. 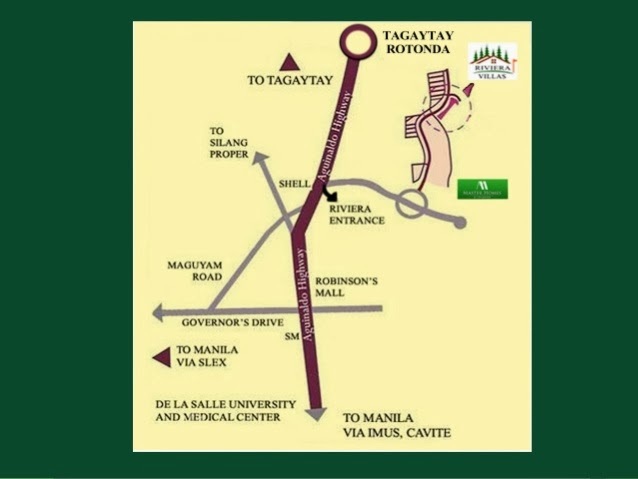 Master Homes at the Riviera is a 10 minutes away from the Tagaytay rotunda an exclusive gated community in the Riviera Residential Estates . Exact address is along aguinaldo highway Silang-Metro Tagaytay . 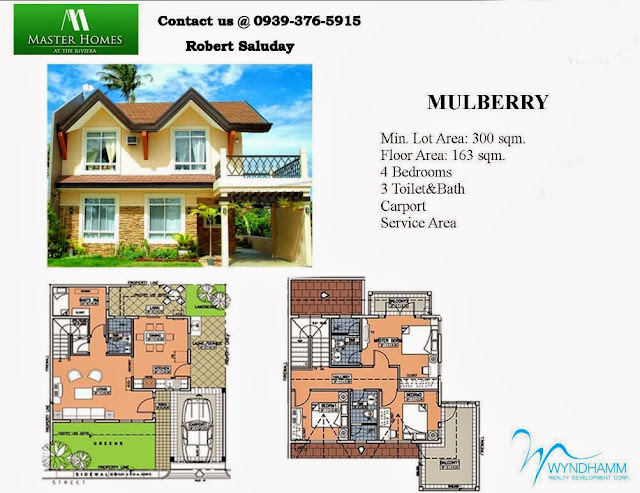 Wyndhamm Realty Developement Corp. is the developer of affordable house and lot in Cavite and Tagaytay as Riviera Villas and Master Homes. Their main office is located in Ortigas Pasig City, Manila Philippines . They have three (3) house model the mulberry, lilac and sarconi . All house models are designed in the luxurious style of the Mediterranean and have lot cuts of minimum of 300 sqm. Free Sports & Country Club Membership for every home purchase. The Sarconi model is now ready for occupancy at affordable yet quality house and lot price package . Master Homes at Riviera Model House Units, all house models are designed in the luxurious style of the Mediterranean and have lot cuts of minimum of 300 sqm. Free Sports & Country Club Membership for every home purchase. Master Homes at the Riviera Payment Term accept bank and in-house financing . Stretch downpayment up to 6 months , longer downpayment is subject for approval . Balance of 70% payable up to 20 years through bank financing . Reservation is Php 100,000.00 and it is non-refundable . Total Contract Price is inclusive of 12% E-VAT and 10% Miscellaneous Fees. Total Contract Price varies depending on the lot sizes . Please check the requirements page . Living at Riviera MasterHomes ensures homeowners a lifestyle at its best. A membership at the Sports Club is included for every home purchase. This means, you get access to the Club’s swimming pools, tennis court, 9 holes Executive Course, restaurant anytime of the day! If you are fond of entertaining families and friends, but don’t like to get hassled preparing for it – you can use the pool area, treat them to a sumptuous meal at the cabanas by the pool side or at the restaurant with the view of the golf course. The kids can play at the playground or run around the spacious jogging path. If you are planning to celebrate an event, you don’t have to go far for you can use the events area also at the Sports Club. The cool relaxing ambiance of a well balanced leisure community with the existing golf course, swimming pools, tennis courts, friendly neighbors and members will add zest to your daily living. Master homes is within the Riviera Golf & Country Club, a renowned, world-class golf community along Aguinaldo highway in Silang, Metro Tagaytay. It is just a mere 10 minutes drive to Tagaytay rotonda. From Makati via SLEX through Southwoods Exit or Carmona Exit and shortcut at Maguyam Rd. Through Coastal Road & Macapagal Blvd. Master Homes Riviera lies at this world-famous golf and country club. Enjoy a fresh and cool climate all year round when you live here. It’s 10 minutes away from Tagaytay so you also get to enjoy the Tagaytay weather. So, what are you looking for? Invest in a house and lot in Silang, Cavite today, invest only here at the Master Homes Riviera! Getting fit and healthy is so convenient at Riviera Master Homes. You don’t have to drive far to a gym and psyche yourself into using the exercise machines. Getting fit and healthy can be fun! An hour of swimming is all you need but if you have enough time, you can play a round of tennis or jog at the jogging path – all of these are accessible at the Sports Club. Any further concern , feel free to contact us on our Contact Us Page or directly to (63) 939-376-5915 .